This name uses Spanish naming customs: the first or paternal family name is Hernangómez and the second or maternal family name is Geuer. Guillermo Gustavo "Willy" Hernangómez Geuer (born May 27, 1994) is a Spanish professional basketball player for the Charlotte Hornets of the National Basketball Association (NBA). Standing at 6 ft 11 in (2.11 m), he plays at the center position. Considered one of the best prospects of Real Madrid, Hernangómez played his first two seasons on its reserve team. In the summer of 2013, Hernangómez was loaned by Real Madrid to Cajasol Sevilla, extending his agreement for one more season in the next summer. On July 17, 2015, he returned to Real Madrid and played for the senior team in 2015–16. In his lone full season for the senior team, he averaged 5.7 points and 3.3 rebounds in 34 games in the Spanish ACB League. Hernangómez declared for the 2015 NBA draft, and was selected with the 35th overall pick by the Philadelphia 76ers. His rights were later traded to the New York Knicks on draft night, in exchange for two future second round draft choices and cash considerations. On July 8, 2016, Hernangómez signed with the New York Knicks. On October 25, 2016, he made his debut for the Knicks in their season opener, scoring four points in nine minutes off the bench in a 117–88 loss to the Cleveland Cavaliers. On November 7, 2016, he was assigned to the Westchester Knicks, New York's D-League affiliate. He was recalled later that day. Two days later, he had a season-best 14 points in a 110–96 win over the Brooklyn Nets. On January 25, 2017, he had a career-high 16 rebounds in a 103–95 loss to the Dallas Mavericks. On February 1, 2017, he had 16 points and 16 rebounds in a 95–90 win over the Brooklyn Nets. On February 15, he was named as a replacement on the World Team for the injured Emmanuel Mudiay in 2017 Rising Stars Challenge. On March 25, 2017, he had a career-high 24 points and 13 rebounds in a 106–98 loss to the San Antonio Spurs. On April 9, 2017, he tied his career high with 24 points and grabbed 11 rebounds in a 110–97 loss to the Toronto Raptors. Five days later, he was named Eastern Conference Rookie of the Month for games played in April after leading all Eastern Conference rookies in rebounding (8.5 rpg) and ranked second in scoring (12.5 ppg). At the season's end, he was named to the NBA All-Rookie First Team. 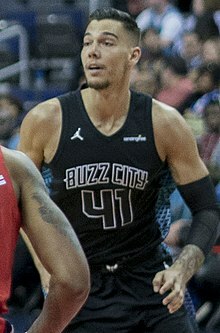 On February 7, 2018, Hernangómez was traded to the Charlotte Hornets in exchange for Johnny O'Bryant III and two future second round draft picks. As a member of the junior national teams of Spain, Hernangómez played at the 2012 Albert Schweitzer Tournament, where he was named to the All-Tournament Team. He also played at the 2011 FIBA Europe Under-18 Championship, where he won a gold medal, and at the 2014 FIBA Europe Under-20 Championship, where he won a silver medal, and was named to the All-Tournament Team. He has also been a member of the senior Spanish national basketball team. With Spain's senior national team, he played at the EuroBasket 2015, where he won a gold medal, and at the 2016 Summer Olympic Games, where he won a bronze medal. He also played at the EuroBasket 2017, where he won a bronze medal. Hernangómez is a son of Guillermo Hernangómez Heredero and Margarita "Wonny" Geuer Draeger. His mother, Margarita, was born in Seville, and is of German origin. His brother, Juan Hernangómez, is also a professional basketball player; he currently plays for the Denver Nuggets. ^ "Guillermo Hernangómez Geuer". Scoresway.com. Retrieved April 25, 2015. ^ "Willy Hernangomez officially returns to Real Madrid". Sportando.com. July 17, 2015. Retrieved July 8, 2016. ^ "DraftExpressProfile: Guillermo Hernangomez". DraftExpress.com. Retrieved November 10, 2016. ^ "Knicks Acquire Guillermo Hernangomez". NBA.com. June 26, 2015. Retrieved June 26, 2015. 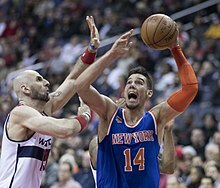 ^ "Knicks Sign Guillermo "Willy" Hernangomez". NBA.com. July 8, 2016. Retrieved July 8, 2016. ^ "Knicks vs. Cavaliers – Box Score". ESPN.com. October 25, 2016. Retrieved October 25, 2016. ^ "Los Knicks envían a Willy Hernangómez a entrenar a la NBDL". Marca.com (in Spanish). November 7, 2016. Retrieved December 3, 2016. ^ "Carmelo Anthony scores 22 points, Knicks beat Nets 110-96". ESPN.com. November 9, 2016. Retrieved November 10, 2016. ^ "Barnes scores 23 to lead Mavericks over Knicks, 103-95". ESPN.com. January 25, 2017. Retrieved January 26, 2017. ^ "Knicks' Willy Hernangomez replaces Nuggets' Emmanuel Mudiay in BBVA Rising Stars Challenge". NBA.com. February 15, 2017. Retrieved February 16, 2017. ^ "Leonard, Aldridge help Spurs topple Knicks, 106-98". ESPN.com. March 25, 2017. Retrieved March 26, 2017. ^ "Raptors handle Knicks to clinch top-3 seed in East". ESPN.com. April 9, 2017. Retrieved April 9, 2017. ^ "New York Knicks' Willy Hernangomez, Phoenix Suns' Tyler Ulis named Kia Rookies of Month". NBA.com. April 14, 2017. Retrieved April 14, 2017. ^ Rohrbach, Ben (June 27, 2017). "Draymond Green, Joel Embiid headline NBA's All-Defensive, All-Rookie team announcements". Yahoo.com. Retrieved June 27, 2017. ^ "Hornets Acquire Center Willy Hernangomez From Knicks". NBA.com. February 7, 2018. Retrieved February 7, 2018. ^ "Willy Hernangomez Player Profile". RealGM.com. Retrieved April 25, 2015. ^ Delmás, Alejandro (September 11, 2015). "Los Hernangómez han pedido el pasaporte de Alemania". Baloncesto.as.com (in Spanish). Retrieved July 8, 2016. ^ Sáez Bravo, Lucas (December 8, 2014). "Hernangómez, el futuro ya está aquí". El Mundo (in Spanish). Retrieved August 16, 2015. This page was last edited on 13 April 2019, at 15:57 (UTC).